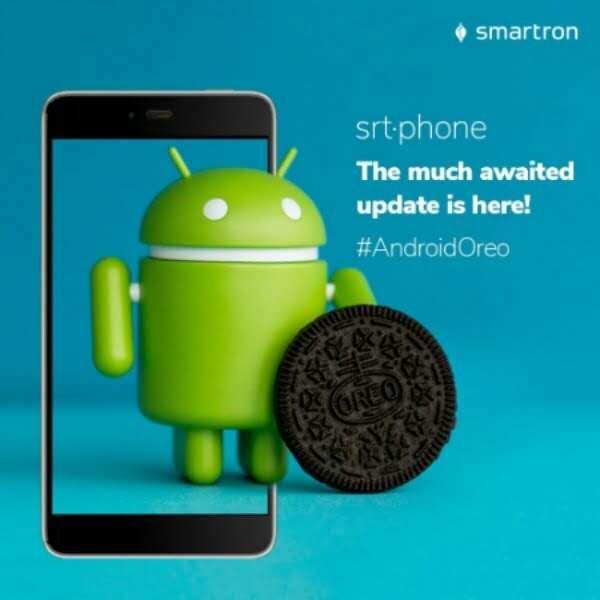 Smartron has started the rollout of Android 8.0 Oreo update to its srt.phone today. The Indian OEM has announced this news on Twitter saying that the update will be available for download starting today. It must be an over-the-air (OTA) update, and the size of the update is unknown at the moment. Back in January 2018 during the launch event of Smartron t.phone P, we were informed that the Oreo update for the srt.phone was in testing phase with select beta testers. And it took over two months for the company to roll out the update. With this rollout, the srt.phone becomes the few smartphones under Rs 10,000 to run the latest iteration of Android. At the time of writing this article, Flipkart is selling the 4GB RAM and 32GB storage variant of the srt.phone for just Rs 7,300, while the 4GB RAM and 64GB variant is available for purchase at Rs 8,999. The price of the smartphone is down by nearly 50% since the phone’s launch back in May 2017. The Android 8.0 Oreo update brings the much-awaited picture-in-picture (PiP) mode, smart text selection, autofill features to the srt.phone. Only two smartphones from Infinix under Rs 10,000 are offering Android Oreo at the moment. Also, Smartron will be releasing the Oreo update to its budget smartphone- the Smartron t.phone P very soon, but the update timeline is not revealed by the company. With the update arriving for the srt.phone, Smartron is expected to start rolling it out to the t.phone P as well in the next couple of weeks. For the currently available price, the srt.phone is better than any other budget smartphones available in the market. The srt.phone flaunts a 5.5-inch Full HD display, and it’s powered by the Qualcomm Snapdragon 652 octa-core processor. The srt.phone is available in two variants and both the variants offer 4GB of RAM. There’s a microSD card slot as well for storage expansion. It rocks a 13MP camera to the back along with a 5MP front-facing camera. A 3000mAh battery fuels the smartphone. It offers 4G LTE, VoLTE, Wi-Fi 802.11 b/g/n, Bluetooth, GPS and USB Type-C port. The srt.phone is also available for purchase on Amazon India and offline stores. Why did smartron screw up the Oreo or nougat update for original tphone?